Well, hi there. I hope you are ready for some awesome holiday goodie ideas because today in my world, Sugar Rush begins. If you’ve been around long enough, you might have seen Sugar Rush #1. Then there was Sugar Rush #2. I took a leave of absence from all things sugar last holiday season and instead of sweetsie treats, I focused on savory appetizers. It was refreshing. But this year, I’m back to the holiday sweetness. In a big way. Each week from now until Christmas, I’ll be peppering you with some decadent, wonderful holiday desserts. Creative cookies for neighbor gifts. Delightful desserts for entertaining. Gorgeous goodies for making just because you have the hankering. And as a bonus, each week, I’ll also be offering you a collage of choice (think: candy collage, cookie collage, etc.) so that choosing what to make will be even easier (or maybe harder depending on how you look at it!). Today’s winner is the almighty brownie batter truffle. 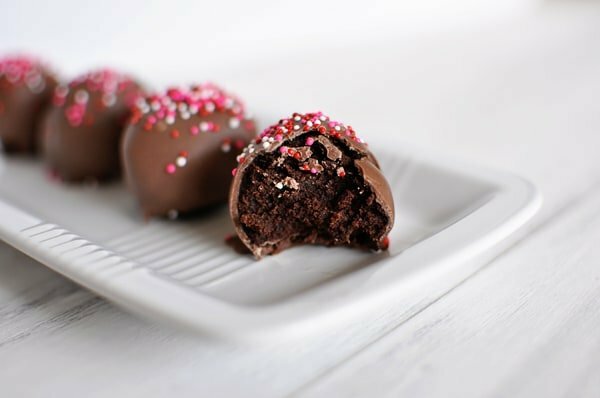 It is rich, decadent, absolutely dreamy and exactly what the name implies: a fabulous little chocolate-coated truffle that tastes enchantingly like a huge dollop of brownie batter. Basically, it’s awesome. And I dare you right now to eat just one. In a large bowl, combine the cocoa powder, granulated sugar, brown sugar, salt and flour until it is well combined. Stir in the vanilla and melted butter until the mixture forms a thick batter. Line a large rimmed baking sheet with waxed or parchment paper. Roll the dough into about 3/4-inch size balls and place them on the wax paper. Refrigerate for about an hour until the brownie batter balls are firm. Prepare another large baking sheet lined with parchment or wax paper. Melt the chocolate or candy coating according to package directions (I usually melt either in a microwave-safe bowl at 1-minute increments at 50% power, stirring in between, until melted). Using two forks, plop a truffle into the melted chocolate, submerging it completely. Lift it out with one of the forks and tap the handle of the fork lightly on the edge of the bowl to let the excess chocolate fall through the tines of the fork. Gently lay the fork on the empty baking sheet lined with wax or parchment paper and use the second fork to carefully nudge the truffle off the other fork onto the paper. Repeat with the remaining truffles. 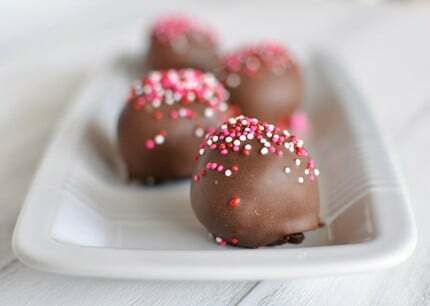 Use sprinkles on top of the truffles before the chocolate sets. Refrigerate until ready to serve. I’ve made this so many times, as whenever it’s someone’s birthday, I’m asked to make it again! Great recipe and I didn’t change a thing! Thanks for sharing! I couldn’t eat more than two as its quite sweet but extremely delicious! THIS WAS A VERY AMAZING DESSERT!!! THE RECIPE WAS VERY HELPFUL FOR MAKING THIS. SHOUTOUT TO ALL THE SOCCER MOMS, ESPECIALLY THOSE NAMED DEBORAH, PAM, AND KAREN!! Dough is too soft to roll! Help! Should I refrigerate first? Yes, you can refrigerate if it’s too soft. These are ridiculously easy, extremely delicious, and so cute to boot. I had everything on hand, I didn’t have to turn on the oven, and everyone in my family loved them. I used Smith’s/Kroger brand semisweet chips for the coating, they were great. Wish I had Guittard or Ghirardelli on hand! I love brownie batter so these were a fun indulgence. Thanks Mel! Random question- I see a few comments mentioning a grainy texture, and was wondering if I could decrease the white sugar to a half cup if that would help? How noticeable is the grainy texture as I was planning on passing some out to new neighbors and didn’t know how to explain so they know it’s supposed to be that way? Hi Katie – you’ll really just have to experiment. I personally don’t think the texture is off-putting – tastes just like brownie batter! Taha – if I remember right, I used Ghirardelli’s bittersweet chocolate. I made these for Christmas treat bags for our families and co-workers this year. They turned out pretty and yummy. Thanks for the fun recipe. I was looking for something easy but also something impressive to make for my husbands office for Halloween. I stumbled across this and said hey, who doesn’t love truffles. Anywho I made these and used white chocolate, chocolate, and peanut butter to dip them in. I also used coconut, pecans, powered sugar, and mini chocolate chips to garnish them with. The texture was a little grainy. Do you think using powdered sugar would help? If so do you know what the ratio is for granulated sugar to powdered sugar? Thanks for the quick and easy recipe! Theresa – the truffles will taste slightly granular because it’s imitating the brownie batter texture and feel. If you want the consistency smoother you might play around with different types of sugar or look for a truffle filling that is more like a ganache and is smoother. Good luck experimenting! I was craving truffles and was curious about these, so I made a small batch (a dozen). Decided to try one before I dipped it, and omigosh. I somehow managed to eat every. single. one. Didn’t even bother dipping them. I was planning on sharing them with my husband when he got home from work, but I’m too ashamed to even tell him that there were any to begin with. I gave these, plus several other items, out as staff gifts and everyone loved them. They are so great! I had about a dozen left over and I ate them all. I had trouble rolling mine into balls easily. It took working the “dough” in my hands quite a bit. I figured it must’ve been not enough butter but I even added some more but it didn’t seem to help it. So I was worried they wouldn’t hold together while dipping but they did. Excellent recipe! Great! I’m making treat bags for friends and needed one more quick but yummy thing to add. Bonus, I have all of these supplies in my house! Hi Mel! I made these last night and brought them to work. They are awesome and a huge hit. I’ve already had three people ask for the recipe. As usual, you never let me down. Thanks for sharing! Just one question though. On a couple truffles my chocolate did that turn-grey-thing. Do you know how to prevent that? I think it has something to do with chocolate temperature/tempering. Thanks! Hi Tiffiny – that’s called “blooming” and it happens, from my limited understanding, when the chocolate has temperature issues. Sometimes it can happen if the chocolate reached too high of a temperature while being melted. It may look fine melted but as it cools and hardens, it develops the streaks. It helps to melt the chocolate until there are still small-sized lumps in the chocolate and just stir those in to melt instead of heating them. That helps bring the chocolate down to a bit lower temp (similar to tempering chocolate). Also, it can happen when, after the truffles or candy have been dipped, the chocolate is cooled to quickly (this has happened to me sometimes when I’ve put them in the fridge or freezer to set up and the chocolate cooled too quickly). It can happen for various reasons but it’s usually due to the finicky chocolate if it has gotten too hot. I made these the other day. I really liked the flavor but was a little iffy on the texture of the filling. They were pretty grainy from the sugar. Did I do something wrong or is this just my personal problem. Made these tonight and they are awesome. They came together quickly and will be very popular at the party I’m going to 🙂 Thanks Mel! Melanie – are you talking about the chocolate for dipping the truffles? You can use whatever chocolate is your preference – milk chocolate would work fine. And no, I haven’t tried freezing them. Sorry! Teresa – I don’t have a recipe for petit fours but I was admiring some on Martha Stewart’s website the other day. She has a lot if you search for them. I love them, too! I love making truffles. I love that these don’t have cream cheese in them, which I love, but worry about how long they will keep. I can’t wait to try these, and I think I will add some peanut butter for my peanut butter cup loving daughter. Do you by any chance have a recipe for petit fours? They are my all time favorite, I usually order them from Swiss Colony or get from a local bakery but I would like to try and make them homemade. I totally just used the word love in this paragraph four times didn’t I, LOL? Oh well…tis the season and what better adjective when talking about sugar rush treats 🙂 . These look GREAT! Two questions – do you use milk chocolate (as opposed to dark chocolate)? Have you ever tried freezing them? Yay for sugar rush! I was hoping you’d do it again this year! Can’t wait to see all your treats! please don’t take that the wrong way!!! my best food photo ever wouldn’t be good enough for a dog’s food blog … I am not insulting your old photos, just saying how awesome these ones are! I just wanted to complimetn your photos. I have always LOVED your recipes, and I know how important photos are to a food blog, and I feel like you have improved SO much, and these are my fav photos yet! I would devour those! I totally have to make them for friends this christmas! Jen – sorry to be a tease! That recipe is the almighty cookie dough fudge I’ve been talking about for weeks and the good news is it will be posted tomorrow! Mel–where is the recipe to your yummy looking chocolate chip white fudge on your heading picture? The picture looks divine, but I can’t find the recipe. Thanks! I love sugar rush! These look amazing! Yeah! Can’t wait! My daughter made your banoffee pie for thanksgiving–first pie gone! So yum! Thanks! Hi Jodee – unfortunately, my search bar is having issues right now. Sorry! It is being worked on as we speak and hopefully will be fixed soon. 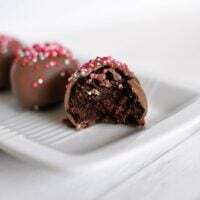 These look like they will rival the beloved Oreo truffles! Definintely going on my ‘to make’ list! Do you have any idea why I get an error when I try to do a recipe search on your blog?? As always, thanks for being my first stop food blog!! YEESSS! I love ‘Sugar Rush”! Looking forward to gathering new ideas. Thanks, Mel! Ooh these sound heavenly! So excited for your Sugar Rush! I was just going through your past ones over the weekend! I can’t wait to see what you’ve baked up this year! Nikki – sure, I think this recipe is pretty adaptable. I haven’t tried it with any extracts or add-ins so you’ll have to experiment. Good luck! Have not made these in years! These never made it to Santa because we ate them-no you can’t eat just one. What a way to kick off sugar rush. Do you think any extracts (mint?) can be added? Or chopped up Andes mints? It’s here!! Woo hoo! So excited!! Susan – nope, no baking. These look awesome!!! I am sure my kids would love them!!! Thanks Mel for always making great recipes. BTW, we tried the spaghetti pie and it was fantastic. I can see why it’s one of your family’s favorites. Hi Kim – I think they would last well up to a week (if they are already dipped and well-covered in the refrigerator). I had some for up to three days and they were great, so the week estimate is my best guess. 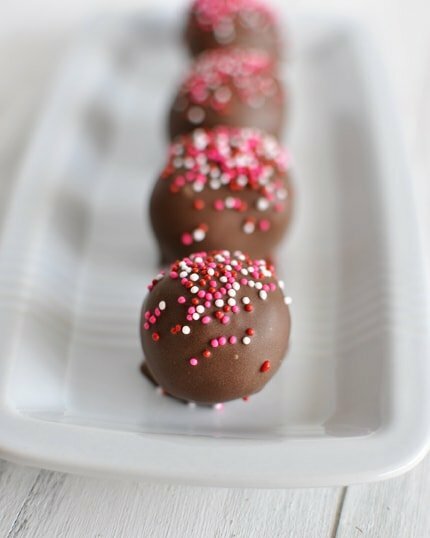 These brownie batter truffles look delicious, and a tin full of these would make the perfect hostess or teacher gift this holiday season. Mel- do you have any idea how long they keep in the fridge? Thanks!